Stepping out of your comfort zone is necessary in life. You gain new knowledge, experiences, feelings that might never be forgotten. However, making that one step, escaping from your bubble is extremely hard. You need to challenge yourself to do it. Do not worry, we are here to help. We have researched best 8 string guitars for you and created a list of the most popular products, together with some tips and information. We know you are used to 6-string guitars, and you must be playing it pretty well as you are already here, but something is missing, right? You feel that there is more to explore. Here we present the list that will help you take that important step. Schecter 1925 Hellraiser Hybrid C-8 is an excellent representative of HELLRAISER HYBRID COLLECTION- meaning that it has taken the best qualities of infamous HELLRAISER and SLS models. It has Quilted maple sculptured arc top, Ultra Access set neck, with Compound radius ebony fretboard. This beast looking instrument comes in two different colors – black (TBB) and blue (UV). The neck has Mother-Of-Pearl offset/reverse dots with a Gothic Cross at the 12th Fret. This instrument is equipped with EMG”s 57/66 Active humbuckers. It feels very easy to play as weight is not a problem. A good sustain is provided by Hipshot hardtail bridge and string-through-body configuration. Overall this guitar has very high quality and delivers a good tone. This instrument is budget friendly and does it all. It is exceptional with its wide range of tones. Even the design of this guitar screams power. It has a really heavy sound and powerful tones, so it will be your perfect companion if you play heavy stuff like metal etc. The LTD H-408B See Thru Black Sunburst has a Mahogany Body with a Flamed Maple Top, Maple Set-Thru Neck Construction with a Rosewood Fingerboard and 24 jumbo frets. It is equipped with the Pickups – active EMG 808 and a fixed bridge, that delivers a lot of sustain and more responsive, super tight sound. ESP H-408B FM STBLKSB will undoubtedly be ready to rock with you all night long. This amazing instrument can be considered as “the beast” among 8-string guitars. It sounds as good as it looks. Just look at its design – matte black finish with The Mother of Pearl ‘Hell’s Gate Skull’ inlay on ebony fretboard. Schecter Blackjack Slim line has Seymour Duncan Blackouts 8-string AHB-1 that are perfect for old school metal and new school screamers. They deliver really wide range of sounds. You will play for hours without getting tired on this beautiful instrument. However, width of fingerboard can be a problem for some users. Due to carbon fiber rods guitar stays in tune for very long time. The action and intonation are really good. You will be pleased for sure by its performance. 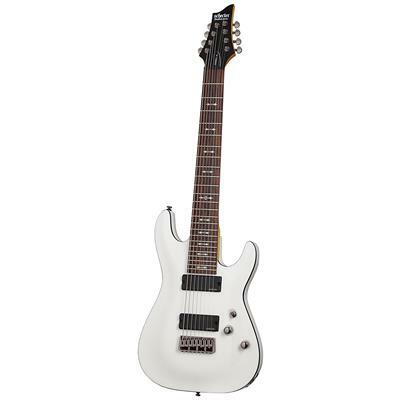 Washburn PX-SOLAR180C Parallaxe Double Cut 8-String is a very powerful instrument, with a lot of sustain and strong tone. It has swamp ash body with a maple set neck and ebony fretboard. Your hand will easily glide through this thin neck. Grover 18:1 tuners with Buzz Feiten Tuning System, will keep you well intonated all the way up the neck. This guitar is equipped with 8 pole pieces Duncan Solar pickups-made specifically for this model. They will keep the lowest strings articulate, even when heavily distorted. 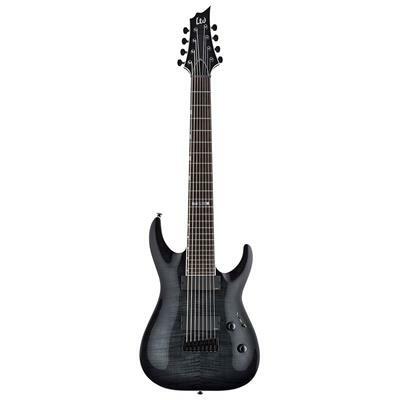 Washburn PX-SOLAR180C Parallaxe Double Cut 8-String undoubtedly has impressive specifications combined with great sound and all this comes in very budget friendly price. This instrument will surely please even a very experienced metal player. This model is extremely pocket friendly for an 8-string guitar. It has basswood body with through-body stringing and a fixed bridge to deliver maximum sustain. Its Wizard II-8 5pc Maple/Walnut neck with rosewood fretboard is very easy to play and comfortable to hold. The strings are really stable and Ibanez does a really good job of keeping tunings flexible and sharp. 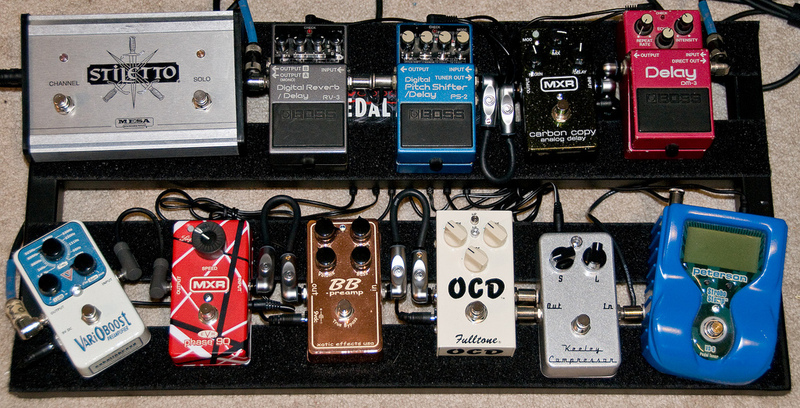 It has got a great growl on the low end for the heavy tones, and the lead tone is very full sounding as well. It is just an all-around great guitar that can be used for any style of music. The instrument is not too heavy so the feel is super sleek, smooth and convenient. Ibanez RG8 8-String is definitely a great deal for the price. Do not let the funny part of the name “Dinky” give you the wrong idea about this instrument. This guitar is a beast. It has a really heavy sound and will let you rock all night long. It has a Basswood body with Quilt Maple Top and 3-Piece Bolt-On Maple Jackson carve neck with a straight-string-pull headstock and Rosewood Fingerboard and 24 jumbo frets. Dinky is not too heavy but not light as well. It is perfect for fast playing because of its amazing and comfortable neck. Jackson JS32-8Q Dinky – Transparent Black is equipped with Dual high-output Jackson pickups that will make your amp scream. 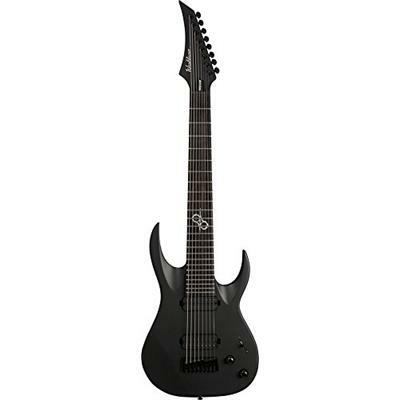 The instrument allows you to experience the best of 8-string guitars and explore the unknown. Schecter OMEN‌-8 surely delivers that vintage vibes. It is available in three different colors Vintage White, Black and Walnut Satin. It has a maple neck and basswood body that delivers the combination of warm and bright tones, together with strength and stability. Rosewood fretboard with Pearloid Semi Goth Inlays gives the instrument cool look as well as a perfect playability. The fretboard is not too wide so it is pretty comfortable. This guitar is equipped with Schecter Diamond Plus pickups which makes aggressive and heavy tones and gives you playground for drop tunings. 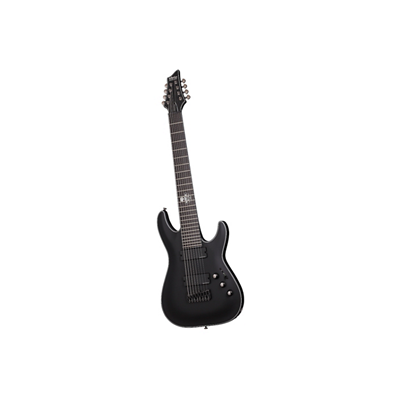 Schecter OMEN‌-8 is not really light instrument. In a nutshell this guitar will make a perfect partner for you. It is undoubtedly a great deal for the price. In this guitar quality is combined with good price. If you hold this beautiful instrument for a second, you will never want to let it go – its black glossy look delivers that vibe of a rock star. This guitar has Basswood body, Bolt-On Neck with Rosewood Fingerboard that gives the sound great clarity. It has DMT Design humbuckers to deliver powerful sound. The instrument has pretty vast tonal register. Dean C850X CBK Custom Series will definitely become your pride and bring a lot of joy. 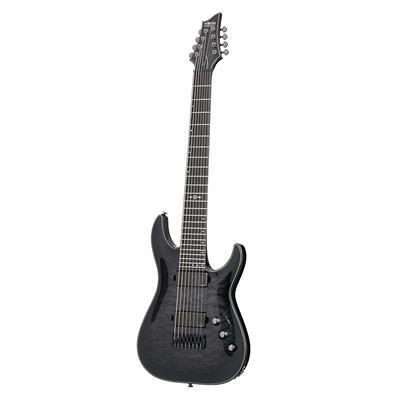 This super affordable 8 string guitar has a comfortable and smooth feel. It is not too heavy but not light either. The instrument has everything needed for 8-string guitar-powerful tone with great clarity. Sometimes you just feel that conventional, usual things are boring for you. You want to change something, step into the unknown, do something extraordinary. In this case, you should be up for the challenges. When it comes to music, it is never enough, there is always something beyond – so we understand what you feel very well. You cannot stop thinking about getting more, getting most of it. We are saying that you are not alone on this journey. It might be difficult and scary at the beginning but you need to work hard and get better day by day. In 8 string guitar we have 2 more strings added to the usual 6 string guitar. They are not very common and the first time were used just recently in 19th century. What makes it priceless is that, it delivers more tonal choices and wider range of sound. Tuning –The standard 8 string guitar is using F#, B, E, A, D, G, B, E. tuning (from low to high). The tuning can be changed according to your personal preference. The rest of the construction can be identically similar to the 6 and 7 string guitars. You might have some questions – what will happen if you remove 2 strings from the 8-string guitar? How will it sound? Will it be different than usual 6-string guitar? If you detach those 2 strings you will get just usual 6-string guitar with some wider frets. In order to use the instrument this way, you need to tune it in a correct way – like the usual guitar. You can also turn it into 7 -string guitar if you wish so. What can be played on 8-string guitar? Usually this instrument is used in jazz and heavy metal. But at the end it is up to you, you can perfectly play whatever you want. Tips for beginners – One thing that we would like you to keep in mind is that 8-string guitar is not cooler than a 6-string, it will not make you a badass player. A lot of people think so, but it is completely wrong. 8-string guitar has extra range to expand chord voicings. It is different but that difference, giving you more opportunities is useless if you do not have appropriate skills. The next thing that we want you to be ready for is the difficulty. It is tough to exchange something that you were used to for so long and turn everything upside down. Do not expect that the minute you hold it, you will be ready to rock. It does not happen that way. You need a bit of patience and work. Highly important fact is keeping motivation to learn and develop. You might want to quit after a day, or an hour, especially if you are a beginner. However, we promise you that practice is the key. Nobody is good at anything right way, you need to educate yourself and work every day. All in all, everything comes down to your personal preferences. Do what feels right for you and what makes you feel better. After reading this article about best 8-string guitars some of you might decide to purchase it and some maybe have their changed minds. That is perfectly fine, because you need to know the reason for everything – what is this guitar for? How should you play it? What genre can you use it for? To understand if you need to buy it at the moment, or if you should stick with the good old 6-string. But if you are saying NO to renovation because of fear, you should overcome it, and hopefully this article will help you with it, as you already have an informational background on what to expect. We wish you best of luck!